DownWithTyranny! : Helping Texas Dig Out From Harvey-- Do They Deserve The Help? Helping Texas Dig Out From Harvey-- Do They Deserve The Help? The bright shiny object is a fake president/TV reality personality acting like a rabid baboon in the middle ring. Off on the sides, though, the Republican Party is systematically destroying the regulations and safeguards Congress and other presidents have put in place to protect America and Americas-- usually to protect them from conservative campaign donors. This week, David Sirota, exposed another classic example, focussing on the bought-off Texas Republicans who helped the French chemical plant that exploded near Houston to attack safety rules. Thanks in part to their efforts, Arkema, the company whose chemical plant is belching poisonous smoke into the already polluted East Texas air, "successfully pressed federal regulators to delay new regulations designed to improve safety procedures at chemical plants... The rules, which were set to go into effect this year, were halted by the Trump administration after a furious lobbying campaign by plant owner Arkema and its affiliated trade association, the American Chemistry Council, which represents a chemical industry that has poured tens of millions of dollars into federal elections." Sirota offered some background on why the rules were instituted in the first place. Arkema has six production plants in Texas and has received more than $8.7 million worth of taxpayer subsidies from the state. Arkema’s Crosby plant-- which OSHA fined more than $90,000 for ten “serious” violations earlier this year and has spewed smoke in Crosby-- appears to be covered under the existing EPA rules because of the kinds of chemicals it uses. While Texas Republican Gov. Greg Abbott has given chemical companies legal cover to hide the locations of their EPA-regulated chemicals, the Associated Press reports that the imperiled Arkema facility houses large amounts of toxic sulfur dioxide and flammable methylpropen, which required Arkema to submit a risk management plan to the agency-- and which would have subjected the company to the strengthened safety rules. However, those rules-- which would have taken effect on March 14-- were blocked by EPA administrator Scott Pruitt, who as Oklahoma Attorney General demanded the rule be withdrawn. The move was a big win for the chemical industry that has spent more than $100 million supporting federal lawmakers since 2008. Among those who have received more than $100,000 from the industry are powerful Texas lawmakers including Sen. John Cornyn (R), Rep. Joe Barton (R), Rep. Pete Olson (R), Rep. Gene Green (D), Rep. Pete Sessions (R) and Rep. Kevin Brady (R). Now Texas members of Congress expect the rest of the country to pick up the tab for their own malfeasance and corruption. Rest assured that the costs of the disaster will be in the Hurricane Harvey relief bill that Democrats have already signaled they will support for humanitarian reasons. And the humanitarian reasons are solid, but with sleazy characters like Trump, Pruitt and Abbott having their fingers in the big pot of money, it is as likely to serve anti-humanitarian needs than go towards the kind of help Democrats are eager to get to Texans devastated by the hurricane. Of Arkema’s six production plants in Texas, five, including the Crosby plant, are near the coast and in the Houston area, raising the prospect of additional explosions due to flooding. The town of Beaumont, where there is a taxpayer-subsidized Arkema plant, has experienced severe flooding. Another plant is located in Houston, and two more, in nearby Pasadena, sit right on the Trinity Bay; one of these plants took in nearly $5 million in subsidies. In its letter to the EPA, Arkema noted that it is a member of the American Chemistry Council-- a powerful lobbying group that has delivered $1.6 million of campaign donations to federal lawmakers since 2010. That Arkema-backed group helped spearhead the effort to block the EPA’s chemical plant safety rule. In January, the council was one of 21 groups that sent a letter to congressional leaders asserting that the new rule’s costs were not worth the alleged safety benefits. ...The American Chemistry Council also lauded Texas Republican Attorney General Ken Paxton for co-authoring a letter slamming the chemical plant safety rule. The letter chastised the EPA for proposing to require chemical plants to more expansively disclose castatrophic releases of hazardous chemicals and berated regulators for requiring independent audits of facilities' safety procedures. ...Paxton received $106,000 from chemical industry donors during his 2014 run for attorney general. His letter was backed by then-Oklahoma Attorney General Scott Pruitt and then-Alabama Attorney General Luther Strange (now a senator), who argued that disclosing details of chemical accidents would imperil national security. Pruitt's campaigns were supported by the Republican Attorneys General Association-- which he chaired and which received $50,000 from the American Chemistry Council during his tenure as a state official, according to data compiled by PoliticalMoneyLine.com. The push to persuade the Trump administration to block the chemical plant safety rules was also bolstered by an American Chemistry Council-backed resolution introduced on February 1 by Republican Rep. Markwayne Mullin of Oklahoma. Among the 65 co-sponsors of the measure to block the rules were 10 members of the Texas Congressional delegation, including five who represent Houston area districts: Brian Babin (TX-36), whose district encompasses Crosby, where the Arkema plant lies; Michael McCaul (R-10), chairman of the House Committee on Homeland Security, whose district sits northwest of Houston; John Culberson (R-7), whose district covers part of Houston; Randy Weber (R-14), who represents a coastal district just outside of Houston; Blake Farenthold (R-27), a representative whose coastal district lies southwest of Houston. Other co-sponsors include Louie Gohmert (R-1), vice chair of the House Committee on Natural Resources, and Lamar Smith (R-21), chair of the House Committee on Science, Space and Technology who has challenged climate science. Weber and Babin are also members of that committee. The Texas lawmakers who sponsored Mullin’s bill to block the chemical plant safety regulations have received more than $652,000 from the chemical industry, according to data from the Center for Responsive Politics. Federal contribution data show the American Chemistry Council specifically has delivered more than $160,000 to the entire Texas congressional delegation since 2008, with top recipients including Gene Green ($20,288), Olson ($18,999), McCaul, who co-sponsored the Mullin bill ($13,500), and Barton ($16,500). Babin and Weber, who also co-sponsored the bill, each received $3,000 from Arkema. Also this year, Texas Senators Ted Cruz and John Cornyn were two of 16 co-sponsors of a companion resolution in the Senate. Cornyn has taken more than $408,000 from the chemical industry over the course of his career, according to the Center for Responsive Politics. Cruz has recieved $234,000 from the industry. The National Institute on Money In State Politics reports that the American Chemistry Council has given more to federal lawmakers in Texas than legislators in any other state. ExxonMobil, Dow Chemical, Koch Industries and Saudi Basic Industries Corporation (SABIC), a Saudi government-owned firm with multiple locations in the Houston area, including its North American headquarters, all lobbied on the legislation, which set the stage for Trump's administration to block the rules. But right underneath these 6 crooks came the large contingent of members who accepted $5,000 bribes, including many of the Texans who districts' residents are most threatened. The two biggest recipients of American Chemical Council bribes in the Senate were two notorious whores, Marco Rubio (R-FL) and Chuck Schumer (D-NY). Last year, the American Chemical Council also purchased the friendship of 6 powerful and corrupt Beltway groups with 6 checks for $10,000 each: the Blue Dog PAC, the New Dem Coalition, the Republican Main Street Partnership, the DSCC, the NRCC, the NRSC. Let's remember some facts about the politics of aiding Harvey victims. Though Texas went for Trumpanzee over Clinton 52.23% to 43.24%, there were still 3,877,868, Texans who voted against Trump. And in the hardest hit county, Harris, Clinton got 706,471 votes (54.2%) to Trump's 544,960 (41.8%). In neighboring Fort Bend County, it was a similar story-- Hillary 134,475 votes (51.6%) to Trump's 117,212 (45.0%). Even in Jefferson County (Beaumont is the county seat), Trump's margin of victory was insignificant-- 42,828 (49.0%) to 42,404 (48.5%). 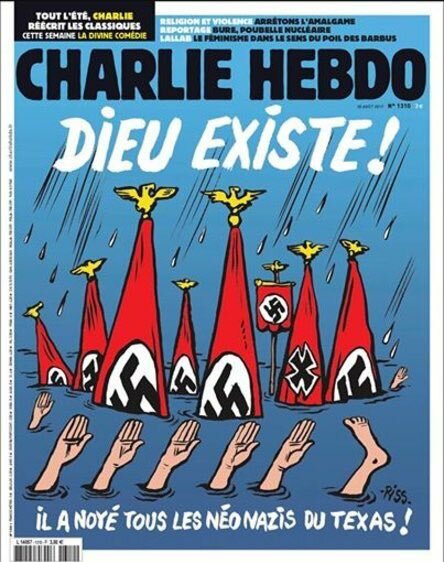 So... this simplistic Charlie Hebdo cover misses an important point. Many of the victims of Harvey are not Trumpists at all-- and don't deserve a double-helping of disaster because of Trumpists in other parts of the state, or even in the same part of the state. On the other hand, Texas is one of just 7 states that doesn't have a state income taxes at all. So high tax states like California, New Jersey, Minnesota, Hawaii, Oregon, Maine and New York, for example, might be wondering about the fairness of their citizens underwriting Texas' rebuilding when the state's need for so much federal aid is predicated on letting multimillionaires and billionaires get away without paying state income taxes. 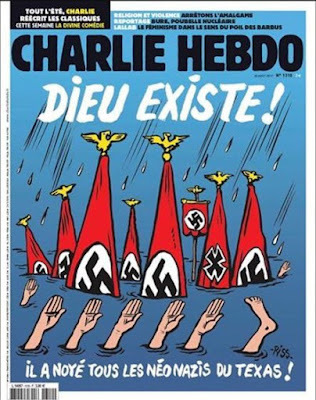 One of the signature flaws of American voters is their inability... refusal to punish pure evil in any way whatsoever. The animated excrement that Texans have inflicted on all 330 million americans have made people's lives miserable, caused untold economic misery and have killed people, though fewer than the 24 million they tried to kill with their health care denial bill... so far. 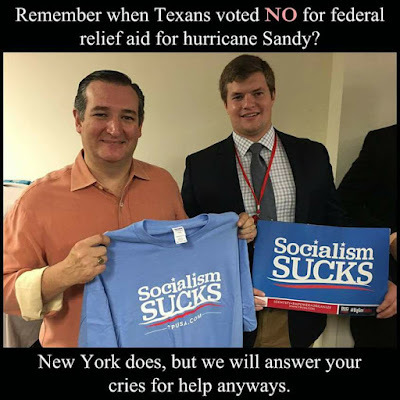 The Texans re-elected all the motherfuckers who would have left NY/NJ et al totally fucked after Sandy. So I say punish the motherfuckers who elected the motherfuckers who refused Sandy aid and want to kill all your grandparents. Give those motherfuckers nothing. I said before, and I say again: dole out the Federal relief funds based on how many Texas Republicans resign from office. They are the ones who should pay the price for their foul corporatist destruction of Public Safety. The people of Texas are only guilty of re-electing such scum to office, so they share a portion of the blame. But this would be a great opportunity for the Democrats to score big points by coming to the rescue of the average Texan. You KNOW that won't happen, right? The Democrats are too corrupt and addicted to corporate cash to see an fabulous opportunity when it's given to them. Sorry, Texans. Maybe next time you'll know better than to let FOX do your thinking for you. My dream scenario: Denied aid from Washington, Texas petitions for admission to Mexico. Back to reality. They'll get what they need, and every nickel will have the grubby fingerprints of a slimy Republican politician no matter how much credit Democrats may deserve. Despite the high level of Dem corruption, they are still primarily in the business of governing while the Republicans focus on winning elections. 2:03, you'd have a R resign only to have another R take its place? What good would that do? Even if the R were replaced by a democrap, what good would that do? Well, ok, relief would be made available. But would any long-term good be done? 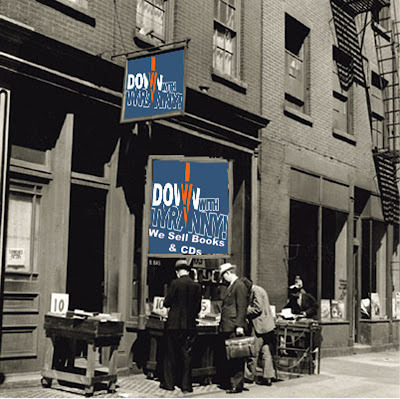 Bank reform? wars? torture? infrastructure? Either way, corporations dictate what gets done. Mexico DID offer aid, did they not? the whole texas delegation (senate+house) should be "manning up" and telling the Federal gov't they can keep their stinking help, texans don't need that kind of sissy thing at all. wouldn't THAT be great to see ..... then the normal people in congress could override them and save texans from their sociopathic rep's. Come on Texas show us your not just all talk!